CALGARY – Doug Taylor is ready to experience the champagne-and-caviar lifestyle that goes along with being an artist. “As somebody once told me over the past year, I’d have to be dead before I’m famous,” Taylor says with a deep chuckle. Taylor is serious, though, about taking a big career-related leap of faith. A welder by trade, the resident of Blackfalds, Alta., has a steady job managing a Red Deer-based oilfield manufacturing company — but in the next year or so, Taylor plans on shifting gears and starting his own small business producing ornamental ironworks such as gates, wine racks, railings, and beds. Taylor will also be using the Calgary Stampede’s Metal Art Showcase — a byproduct of the Stampede’s annual World Championship Blacksmiths’ Competition — as a springboard to launch his new career as an artisan. 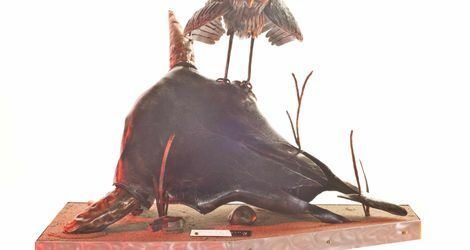 During this year’s 10th annual Metal Art Showcase, held on Saturday, July 7 at the Victoria Pavilion, Taylor won his second straight title in the Non-Forged Metal Art category with his steel-and-copper composition entitled Fight For Survival. His metal-based artwork is attracting more and more attention, and he’s hoping it will be a growing element of his future ironwork business. “I talked right after Stampede to a friend who owns a gallery in Kelowna. They were really excited, and they said they’d like to hold a small exhibit — display a few of my pieces,” says Taylor. “It’s starting to pick up. I’ve handed out some cards. I’m doing pieces for charity auctions. The Stampede’s 10th annual Metal Art Showcase drew 24 entries from all over the world, racking up total sales of $15,225 at related auctions. The competition features works in two distinct categories — Traditional Forged Metal Art, created at the blacksmith’s forge, and Non-Forged Metal Art, whose pieces consist of steel, iron, copper, brass, aluminum, and more, and are crafted using techniques such as welding, cold bending, stretching, wire artistry, and silversmithy. “The Stampede’s Centennial was definitely a prominent theme in the artwork we saw this year. Very interestingly executed in a bunch of diverse manners by a bunch of diverse artists,” says Heather Hartmann, co-chair of the Stampede’s Metal Art Showcase subcommittee. “Shane Seib of Sylvan Lake had a number of Centennial pieces. One of them was made of 100 rings, and it wound up being 100 inches tall. Another of his pieces was made up of timing chains that formed the number 100. Taylor won $1,500 and a Stampede buckle for his victory in the Non-Forged Metal Art category, while Walter Frehner of Switzerland was runner-up, or reserve champion, collecting $750 for his entry Wilderness. Another of Frehner’s works, Bullrider Pendulum, took top honours in Traditional Forged Metal Art, a distinction worth $1,500. Daniel Zwissler, also of Switzerland, was runner-up in the forged class, and earned $750, for his entry Eagle. The third element of the Metal Art Showcase, the Potluck Forging class, was held earlier on July 7 under the Big Top. Teams of one to four blacksmiths involved in the World Championship Blacksmiths’ Competition were given 90 minutes, and unlimited scrap metal, to create spontaneous works of art. Eight of those pieces were sold in a live auction immediately following the Potluck Forging class, with all proceeds going directly to the artists. Taylor also submitted two pieces in the Traditional Forged Metal Art class this year — a barnboard plaque, in honour of that Centennial theme, entitled Calgary Stampede Centennial, and a tomahawk-peace pipe combination rooted in a tree stump called Forgotten Ways.